I can’t begin to tell you how great this little appetizer was last night. I have been wanting to try making this for a long time so when buying the Salmon, scallops and shrimp for the kabobs we did, I just bought a little extra salmon. 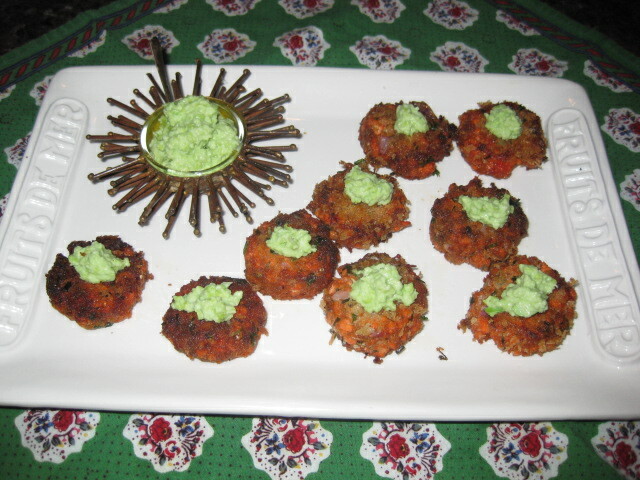 I made my salmon cakes similar to how I make crab cakes. I tried them with Panko bread crumbs and also Italian style bread crumbs. I preferred the Panko. I forgot to put the pickled ginger on when I first put these together. I went back and added the ginger to the ones we had not already gobbled down. It really makes a difference. 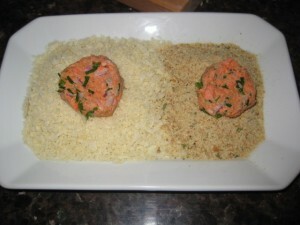 Mix the salmon and all other ingredients except for the ginger and wasabi puree together in bow. Make small cakes about 1 1/2″. Coat the cakes in the panko bread crumbs. Fry in oil until nice and brown and drain on paper towels. To assemble, put a folded piece of pickled ginger and a dab of the edamame wasabi puree in center. 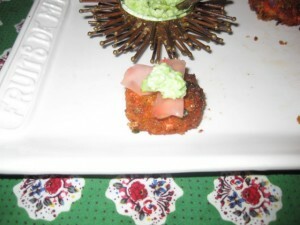 I’m thinking the next time I serve these for a party I’m going to take a cucumber, score it with the tines of a fork, cut in 1/4″ slices and put the little cake on top. Will be easier to eat without crumbling apart. This made about 10 small cakes so you may want to double the recipe. Next time, I may thin down the wasabi topping and drizzle some on the plate. For Wasabi puree: Put all this in blender or mini processor and blend until you have a smooth paste.